Shamefully I have to say I was sceptical when I saw maid of ace for the first time. How can a band be this good and I have heard nothing of them? Not only was I unaware of their existence but the fact that the four siblings from Essex hadn’t a history of punk that I could rattle knowingly about was somehow an impediment. Thankfully that prejudice dissipated by the second time I saw them. If I listened to much metal growing up I would know a bit more about Girlschool as it would seem that would beta good reference point here. 4 women thrashing out songs that sound like they are stuck to a gutter. The songs however are trying their best to scrape themselves off that metal pipe and make their way into your soul. It’s dirty, it’s heavy and at times fast. The ramones never feature far from any discussion on punk rock and maid of ace have scuzzed up that influence, I’m sure there are influences a plenty here as the 11 songs dip into various punk genres down through the years but always end up coming back to that dirtier punk rock and roll sound. It can’t get away from it. 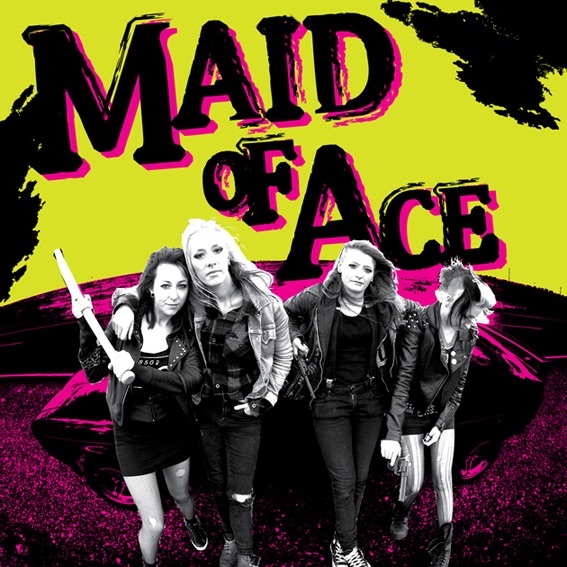 With song titles like sick of you, spittin blood, cannibal and dirty girl you get a good feeling where maid of ace are coming from. With a dirty fuzzed up guitar sound on top of snarling vocals to accompany such titles you may get anoucture of these four siblings. Bone Deth is the highlight for me. When Aison proclaims “when boredom and poverty has taken its toll, losing all control to this rock’n’roll, we’re goin’ down” as the rest of the family scream “Bone Deth” I do wonder what Christmas dinner must be like in their home.